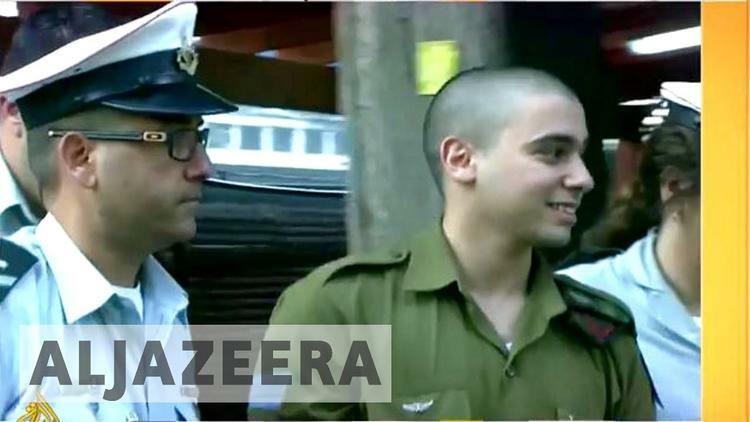 On January 4, 2017, Elor Azaria, an Israel Defense Forces (IDF) soldier, was convicted of manslaughter by the Israeli military court. Azaria, now 20 years old, was found guilty of killing Abed al-Fattah al-Sharif, a 21-year-old Palestinian man, in the Israeli-occupied West Bank city of Hebron on March 24, 2016. Azaria shot an already-wounded al-Sharif in the head after the latter had allegedly tried to stab another Israeli soldier at an IDF checkpoint. Another Palestinian man, Ramzi Aziz al-Qasrawi, also 21 years old, was already dead. The court deemed Azaria's statements on the matter insufficient and contradictory, since he initially claimed that al-Sharif was already dead when he shot him and then later changed his deposition to state that he thought the Palestinian man was wearing a suicide vest and was, therefore, a threat. The video of the murder, legally referred to as an ‘extrajudicial killing’ in Israeli courts, was released in March 2016 by the Israeli human rights NGO B'Tselem, which documents human rights violations in the occupied Palestinian territories. At minute 1:50, Al-Sharif is seen unconscious on the ground when Azaria shoots him in the head. The footage of the incident that B’Tselem released in March began at a point in time in which the second assailant, Ramzi al-Qasrawi was already dead. The military has recently lifted the strict travel restrictions imposed on Tel Rumeida, so for the first time since the incident, B’Tselem field researcher Manal al-Ja’bri was able to get into the neighborhood and collect testimonies from its residents. The testimonies of two of residents, Nur Abu ‘Eishah and Amani Abu ‘Eishah, raise concerns that al-Qasrawi was also executed with a shot to the head, as he lay injured on the ground after having been hit by gunfire elsewhere in his body. The soldier’s conviction was deemed exceptional by many, including B'Tselem, as Azaria was the first IDF soldier since 2004 to be convicted of manslaughter. This despite the fact that, between 2015 and 2016 alone, Israeli forces killed at least 124 Palestinians in the West Bank, including East Jerusalem, 22 in the Gaza Strip, and 10 inside Israel, according to Amnesty International. B'Tselem said it was one of the few cases where there was no “whitewashing by the army”. This is a difficult and painful day – first and foremost for Elor, his family, Israel's soldiers, many citizens and parents of soldiers, among them me … I support granting a pardon to Elor Azaria. Some view Azaria's sentence as a positive step forward. Hebrew University of Jerusalem lecturer Robbie Sabel stated that “the court has done a wonderful job” in delivering such sentence. I think it's a false conviction. The Israeli legal system is supporting the occupation. As Palestinians, we are not only suffering from one soldier. We are suffering from all the soldiers who are occupying our own homes, our own cities and our own streets. I think that the one responsible for the killing of the Palestinians is not just Azaria but also the occupation and the military system in the occupied territories. It was a videographer trained by Adro who shot the footage. Adro explained that there wouldn't have even been such a trial had the video not been released and that the videographer received death threats from Israelis after releasing it. Similarly, Ayman Odeh, leader of the Joint List, a political alliance of four Palestinian-dominated parties in Israel, emphasized that while this episode was recorded and used as evidence in court, there are many others that are never filmed. Relatives of the deceased raised their voices against the conviction, as they thought it was a “perversion of justice” since manslaughter is a milder conviction compared to murder. The verdict is not considered by activists as ‘exceptional’ because there is the possibility that the pardon will take place, commuting the sentence into a milder one. Speaking to Al Jazeera, Aida Touma-Suleiman, a Palestinian member of the Israeli parliament said that historical precedents, such as the amnesties given to security officials involved in the Kfar Qassem Massacre and the Bus 300 Affair, suggested that Azaria could be granted a pardon. She also compared Azaria‘s trial to that of Ahmed Manasra, a 13-year-old Palestinian who was sentenced to 12 years in an adult prison in November 2016 for a stabbing attack that wounded two Israelis.